Well known Birmingham vocalist Danny King (see Danny King and The Dukes and Danny King and The Royals) put together a new backing group in 1965 called The Mayfair Set. The band included guitarist Trevor Burton and drummer Keith Smart, both from Aston as well as bass guitarist Dennis Ball and organist Roger Harris. Trevor Burton was born Trevor Ireson on March 9, 1949 and lived in Whitehouse Street, Aston. He started playing guitar at a young age and was leading his own group called The Everglades by 1963. Also from The Everglades was the Mayfair Set’s drummer Keith Smart. Danny King still retained a recording contract with Columbia Records and his next single recorded with the Mayfair Set and entitled Pretty Things, was released in January 1965. The record was produced by Norrie Paramore and may have featured Roy Wood from Mike Sheridan’s Nightriders on session guitar. Despite gaining the band some local attention, neither this or the follow-up Mayfair Set single Amen (My Teenage Prayer) managed to gain a chart placing. Danny King left The Mayfair Set in January 1966 to become involved with a new group (see Locomotive) and a short time later, Trevor Burton had also departed to become a founding member of The Move and the Mayfair Set disbanded soon after. Keith Smart also joined a new group in 1967 (see The Lemon Tree) and would later play drums for The Uglys and Mongrel before finally making the big time when that group formed the basis for Roy Wood’s Wizzard. Dennis Ball joined his brother Dave in the Ace Kefford Stand in 1968. Danny King continued to perform and record occasionally throughout the later 1960s and still remains one of the most respected and admired Birmingham vocalists from that era. A new The Mayfair Set re-grouped in 1966 after Danny King left. The line-up was Chris Evans and Jim Murphy (both guitar and vocals), Denny Ball (bass guitar), and Dave Reay (drums). They went to Germany where they recorded a couple of singles that were released there on one of the local labels. Danny King was well known around Birmingham in the early 1960s as an accomplished singer and his backing groups would include members that went on to success in groups like The Moody Blues and The Move. His real name was Arthur Benwell and he became interested in rock ‘n’ roll in the late 1950s to an extent that he started collecting imported American rock and blues records and eventually amassed one of the largest and much envied collections in Birmingham at that time. He formed his first band as Danny King and The Dukes which included guitarists Alan and Brian Hancox and Albert Eccles who would shortly change his name to Clint Warwick. Danny King and The Dukes became much in demand for bookings and in 1958 they were contracted for a season at Butlins Holiday Centre at Ayr in Scotland with the arrangement working out so well that they were able to return there the following summer. By 1960 however, Danny King had split from The Dukes who replaced him with singer Gerry Day, and became the frontman for another Birmingham group (see Danny King and The Royals). After a few years, Clint Warwick would leave Gerry Day and The Dukes to become one of the founding members of The Moody Blues. In 1960, Birmingham singer Danny King, previously of Danny King and The Dukes became the frontman for a group called The Andy Capps (not to be confused with The Andicaps whose members included Jeff Lynne). Danny King re-named the group The Royals and members included drummer Bob Sheward, and guitarists Tommy Owen and Garth Quirke. 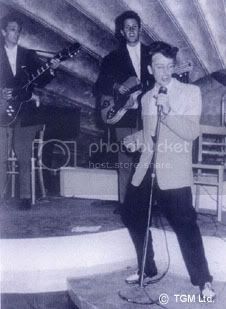 Danny King and The Royals were soon booked to appear at the Top Ten Club in Hamburg, Germany alongside other groups including The Beatles who were unknown outside of Liverpool at the time. 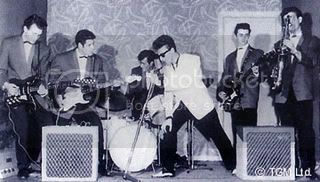 When London record producer Norrie Paramore went to Birmingham in 1963 to check out local groups, Danny King and The Royals were one of the acts to be signed up at the Moat House Club auditions. Despite a recording contract however, things did not turn out the way Danny King wanted with Norrie Paramore insisting on using Mike Sheridan’s group The Nightriders to provide the backing on Danny King’s records as well as selecting the material that he should record. Somewhat disillusioned, Danny King split from The Royals and started performing around Birmingham sporadically while looking to start a new project. The Royals also had disbanded by the end of 1963. An opportunity came in early 1964 when Danny King joined up with his former bass player from the Dukes, Clint Warwick along with drummer Graeme Edge from the Avengers. They wanted to form an outfit similar to the Spencer Davis Group and play rhythm & blues, a style of black American music much favoured at that time by college and university students. Singer/guitarist Denny Laine from the Diplomats also wanted to get involved, so the new group started rehearsing and came up with the name R&B Preachers. Before long, singer Ray Thomas and piano player Mike Pinder who had both played in a local group called El Riot and The Rebels had also joined but perhaps feeling the need to strike out on his own, Danny King lost interest in the project and left (see Danny King and The Mayfair Set). Within a year, the R&B Preachers evolved into The Moody Blues and were enjoying world-wide success with their hit record Go Now. saw danny king perform with the bev bevan band at buxton on may 23 2013.great show and danny was mesmerising, brilliant performance. The last incarnation of The Royals was Chris Jones on lead guitar, Ace Kefford on bass and Barry (Baz) Smith on drums. The band was formed after The Chantells broke up and Danny was desperate to have the Chantelles rhythm section so he asked Chris, Ace and Barry to join him in The Royals. It was eventually decided a change of name was needed so a competition was organised by The Birmingham Mail to find a new one. The eventual winning name was The Jesters. Danny King and The Jesters were signed to Norrie Paramore.